On the other hand in the same Jerusalem, there was a pool where people with pain travailed, it harboured sickness, diseases and a lot of misery. The same town but at different locations. This picture message reminds me of heaven and hell. Heaven where people merry and hell where there is anguish. Multitudes are going to hell every day but selected few make it into heaven. The Bible says “…many are called, few are chosen” (Matt. 22:14). I pray you will be among the chosen few that will make it to heaven in Jesus name. This man by the pool of Bethesda spent 38yrs of his life wasting away but with God, on our side, it would take less than 38 days for you and I to come out of pain. Verse 3 can be used to describe the church. The church is made up of imperfect people with all kinds of ailment. We all come to church waiting for the move of the Spirit but all we need to do is to create the right atmosphere. This man in question has been by the pool waiting for somebody to help him but no one could until Jesus came. Jesus asked in verse 7; “Do you want to be made whole? He replied Sir I have no man. Some people are looking up to a man. Men at their very best are still men. Only God and His word stay true. Who are you looking up to? Where does your help come from? Your help should come from God. If you are in the same school of thought as this man; who thinks his help comes from man, I want you to know God is the only helper that is guaranteed. Even your man of God cannot help except the grace is given to him by God. Man may want to help, they can have good intentions but can suddenly go bankrupt, man can die, and man can be sacked. Man is limited in so many ways. However, there are people we should be praying for, “Helpers of destiny” and you are one to somebody else. Helpers of destiny are people orchestrated by God to do you good. A story was told about a Pastor who suddenly died. It happened that an elderly woman came to visit who never knew he had died, she began to wail so much after she was informed that people wondered, People got to know afterwards that the Pastor that died use to give this woman money for upkeep every month and she came to collect money this fateful day when she heard the news that the man had died, she put her hope in man. You can say that “I have God” but have you done something lately that will make him move in your life. Provoke God’s blessings. – Why not challenge God. Many years ago there was a story about a man who did not qualify for a National Insurance (NI) number but insisted to have one, so he fasted for some few days and applied to get his NI number. On this fateful day; he was on the queue as it was about to get to him, the woman that was serving and had served every other person stood up for a break and was replaced by a man who for some miraculous reason did not ask for his credentials and gave him the NI number. What can our God not do? Why do you look to man, why not look to God? The man with the issue of blood had no one but had to look up to God. The 4 lepers had no one to speak up for them but they had to take the difficult situation. Zacchaeus was too short to climb a Sycamore tree. What are you doing? God is saying take that step of faith, stop wasting time. Don’t just sit there. Do something about your situation. Don’t say there is no job in the North East, so I will just sit here. In the midst of joblessness, some people are still finding jobs. One thing I have noticed about Christians, we are not doing enough of the right thing. For example; if we put a small quantity of sugar in tea; it would not taste sweet but put enough sugar and you will be able to taste the sweetness. I want to challenge someone today, memorize a scripture a day and see what God will do. There is someone here what you have been waiting for, for a long time has not come because you look unto man. In the end times, apostasy will fall in. Again the man by the pool was afraid of change and did not envisage the liberty that has been shown to him when Jesus asked: “will thou be made whole?” Change is sometimes difficult and we often cling to what paralyses us and the problem that may paralyze. Do not hide your problem from who would help. It is not where you are located but what you carry for your problem shall pass. After the man was healed, he suddenly realized he could do a lot of things. Sometimes men may have to disqualify you from God to qualify you. Grace was made available to him to cover his 38 years. Jesus asked but the man did not know that the solution he needed was staring him in the face. No matter how heavy the rain falls, only the thirsty will drink. Only the hungry will smell the aroma of the bread from far away. Equip yourself with the word and gain foresight. Adversity causes some people to break/become record breakers, be a record breaker. To be healed is one thing, to be in perfect health is another, to be of God healing power and be a channel for healing to others is another thing. Elevate your faith. The man was trying to stretch his faith, no one believed him. Maybe no one has ever affirmed you but God affirms you. Affirmation is a good antidote to discouragement. People may not see your labour of love. They have not encouraged you but Jesus encourages you today. Years ago, the Spirit led me to write a note and put in my daughter’s lunch box… “I love you, I believe in you” she never forgot it. She even said during her break one of her friends said, “I wish my father was like that”. Affirmation goes a long way to encourage a child. Affirm your spouse. It could stop someone from committing suicide. Your boy that seem wayward; encourage him, tell him you love him despite his waywardness. Jesus affirmed the man by the pool “Behold that have been made whole, sin no more” (John 5:14). Your situation might have played you for years but it will not end like that. Have faith in the Only God who is able to make every impossibility possible. Glory be to God. Halleluiah. 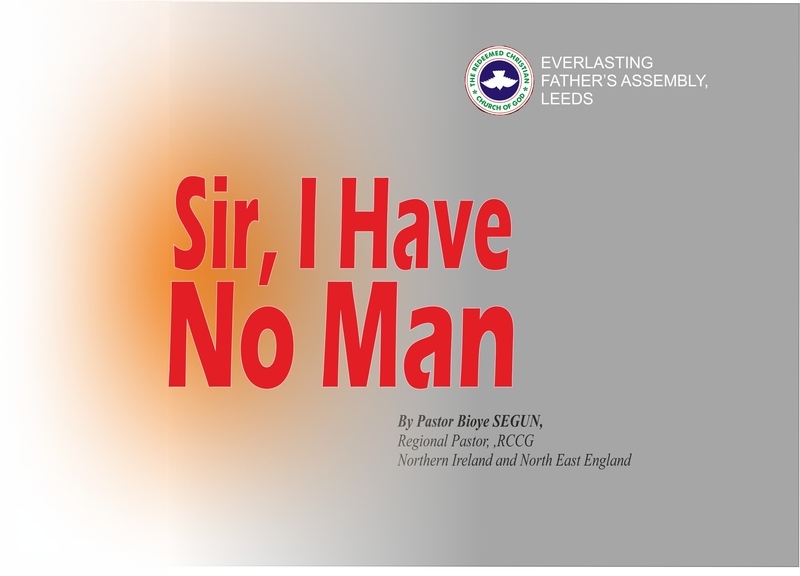 The sermon, Sir, I Have No Man, by Pastor Bioye Segun, Regional Pastor, RCCG Northern Ireland and North East England, was delivered on April 22, 2018.